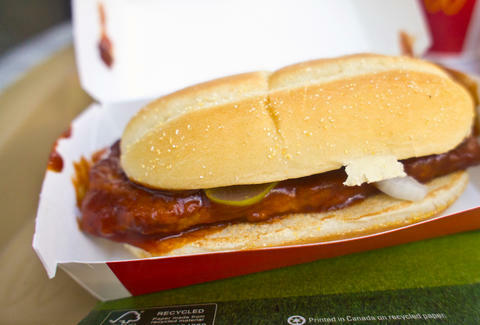 If you spend each year counting down the days until McDonald's McRib returns, you're not alone. And now there's an app to prove it. People love their tender little salty-sweet BBQ sandwiches so dang much that McDonald's recently released an entire app just for hunting them down. The iOS 10 McRib Finder helps hungry customers locate the famed limited-time menu item by using the phone's GPS system. The innovative product couldn't have come at a better time. This year's McRib, released on November 7th, hit just half the country's stores, down from 75% in 2014, Digiday reports. And with so many mega-fans littered throughout the country, we wouldn't be surprised if this app incited more than a few McRib-themed road trips. As a ridiculous added bonus, the app even comes with a special keyboard full of custom McRib-inspired stickers. So move over bacon emoji, it looks like McDonald's meaty new clipart might have just beat you at your own game. Meredith Heil is a staff writer for Thrillist. Even the McRib was jealous of the fries, she could see it through his artificial meat eyes. Track her down @mereditto.